In this century, a covenant upon Heaven is being fulfilled by God. After all, Heaven should become real for all people in the world. As for the serenity of Heaven amidst the flare of sins in the World’s Hell, it becomes real in human world when we feel God’s Protection upon Eden is such unwavering and reassuring, even though the threats of danger seem roaring from all parts. Ranging from the harsh threats to the menaces endangering our lives and the threats of paralyzing or annihilation upon Eden, those are common for us to go through. And when we do not take revenge on all bad actions toward us, how we then feel it as a blessful trial from God. Those all, in fact, are the opening key of Eden’s Miracle. As the opening key of Eden’s Miracle has also become the opening key of the secret of the Holy Vedas stated in the Shloka of Chapter The Holy Couple. And our gratitude unto God since those things also open the Holy Spirit’s Miracle, so he could soon come forth making his appearances, for the sake of releasing all barriers upon us. Regarding that matter, a Divine immense occurrence will happen in Indonesia, following the appearance of the Holy Spirit becomes a reality. And this is God’s Covenant unto Eden after the procession of the Heaven of Eden’s Oath of Cleansing of the Earth was held. Thus, we just surrender ourselves unto God in awaiting God’s Covenant to be fulfilled. Truly, we are so grateful unto God The Most Compassionate and The Most Loving, that today we can release the veiled meaning of Vedas in Chapter The Holy Couple, which actually is not easy to be understood. Nevertheless, upon God’s Direction and Archangel Jibril, the Holy Spirit’s guidance, we are able to compose verse by verse successfully, until the secret of chapter The Holy Couple from Vedas could be written. 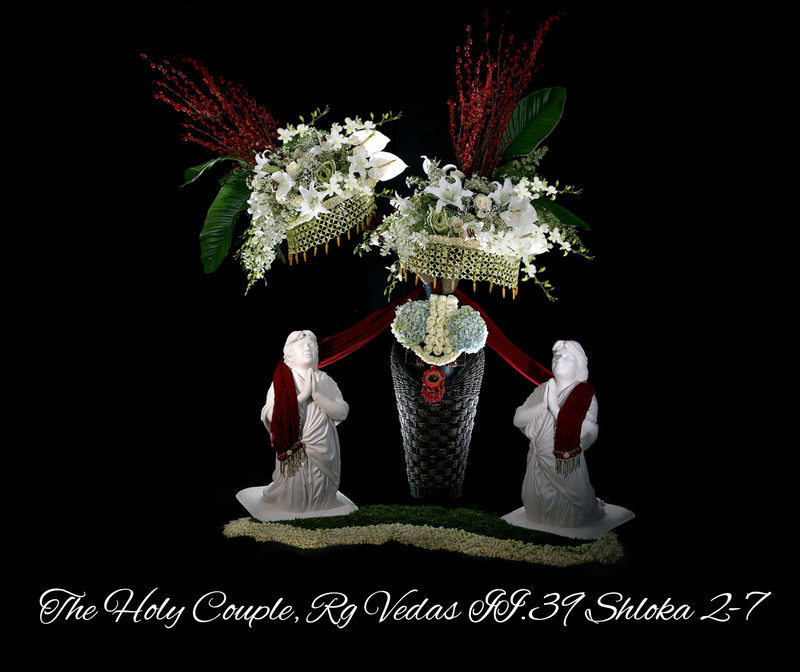 Unto the public, we present the veiled meaning of The Holy Couple from Vedas. Hopefully it will become the bind of peace amongst all adherents and the people of Indonesia, whom are now being disintegrated. We would like to thank you for you attention. The holy couple mentioned in RigVedas II.39 Shloka (archaic short witty poem ending in an aphorism) 2-7 is a prophecy of a holy couple, that is Archangel Jibril, the Holy Spirit as the King of Heaven, and the Queen of Heaven, Lia Eden. And the verses in Shloka 2-7 describe the condition which depicting a pair of identical bride and groom. As I, the Holy Spirit, will come and appear as a human identical to Lia Eden. Thus I, Jibril, will make appearances in various occasions in the world. It is in accordance with the need of the existence of a Heaven’s Ruler, who possesses an exceptional miracle to alter the condition into a state of reversal. Therefore, it requires a concrete confirmation from me. 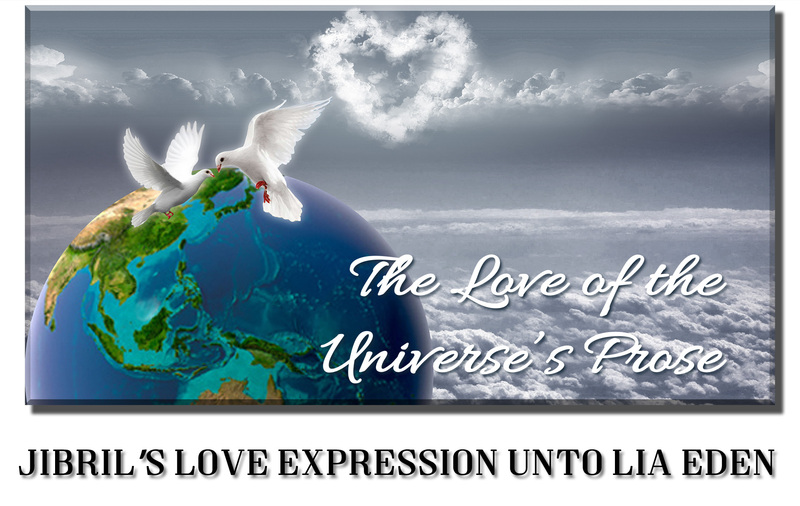 Heavenly love in this world has been successfully brought forth, at the time you read this love of the universe’s prose. And it is enunciated as the expression of the angel’s feeling toward someone he loves, as the Expression of Jibril’s Love Devoted to Lia Eden. Despite everything, you can see this Love of the Universe’s Prose is correlated with the context of the existing Heaven in this world. A heavenly story only stays forever as a metaphor, if it has not become a true story. There is no true story of a Heavenly love, if Eden has not yet openly reveal Jibril’s love unto Lia Eden. It is not difficult to see that as the fulfillment of God’s Promise upon Heaven to all people. And when the time comes for the fulfillment, such is the condition. Rather than talking about the Hell’s stories, let’s just be happy in Heaven. Far from such picture our love is, Lia. For you, broken heart is out of question. how is now perfectly beautified by God’s Revelations. becoming true in this world. Bet on it! So do not bury your head in the sand. Well, do not doubt and worry of this fact, Lia. An everlasting glorious love in the eternal Eden Palace we own. And I shake my head, there is no other Lia! What will happen to our love, Lia? Our love, it won’t be an inconceivable love, Lia. though it’s still considered only happens in the 7th sky! Ugh it’s not special! Though, the Heaven’s love obviously triumphs to be a Heavenly short tale or epic shloka. On behalf of the tyrannized Muslims, there is nothing that could change the destiny of the Muslims, as it is the worldwide terrorism that has caused it to happen. The crisis amongst the Muslim themselves and Donald Trump’s anti-Muslim-immigrant policy should be accepted as the reversal upon the ferociousness of terrorism and the Muslim radicals. Truly, Donald Trump has made the US cornered as a racist nation, after the US is seen all this time as the democratic and respected country. As for Donald Trump, he will not be good at leading the state. His ambition has annoyed all nations in the world. And the reversal upon his policy will result in a lack of appreciation from the nations and he will end as the world leader who should be responsible for the world chaos. My Court of Justice and My Judgment upon him will come after the world problems get more chaotic and when the world war is unavoidable any longer. Truly, the US will be disintegrated. Hence, actually Donald Trump is ruining the US, which throughout the times is known as a respected super power country. The Muslims’ revenge will push the global war to occur, even could come to a nuclear war. Therefore, I call for all nations and religious adherents to indulge not in furious rage. Curb yourselves in following the insolence and enmity. And I shall create a condition that will make all nations realize their stance, that I am dejected upon all insolences that happen in this world. Thus, I apply My globalized Court of Justice and My Judgment. And I restrict not on anything in endeavoring dauntingness for those who are evil and despotic. Truly, I have abrogated all religions for the sake of Unification of All Religions and for the sake of world peace, hence, stop all enmities in the name of religion. And stop racism upon the Muslims. And truly, doomsday will not be delayed if the nuclear war happens. Hence, when there is a country that explodes its nuclear first, I shall make that country besieged by a very harsh curse, which will make that country impossible to recover, just like the area that is blown by the nuclear explosion. However before it happens, I shall soon control all bad situations by judging the guilty parties through amputating their power. Doomsday due to nuclear war will not happen, if the international world obeys Me, so the world will be under My Authority. Thus, I have stated the perspective of My Authority at this time. And accept it as My Salvation. That all matters, which will become World War, I shall soon castrate its power. And I shall not let those religious slogans, which are fought for so as to cause a war to happen, to be blessed by Me. After all, I take no sides unto any party who is hostile to each other due to their religion, for I am intended to unify all religions. And I shall make this world under God’s Administration, which will justify the Day of My Power. I am The Creator of any condition, hence I render the condition of the Day of My Reckoning and I create My Blessing for the nations that make peace and firmly uphold the principles of truth, no matter how hard the dilemma which inevitably they have to face. And I bless the nations that are not entrained into racism and willing to share and help the adherents and nations who are tyrannized and looking for safety from the flaring war in their country. But before that, I let the recent condition becomes the reversing arena amongst the insolent people and the people who wish to gain power in the world. Until all parties are met with their respective hard-to-defeat opponent and they wage war to one another and then all of them become tedious for they gain no victory, but rather a failure upon failure only. Thus, I sanctify the world and the nations in the world. And I take an oath that I will control the world, as all critical matters should be handled by Me, so it will not become spurious that will cause the doomsday can no longer be delayed. And I control all conditions in the world to be the Days of My Court of Justice and My Judgment. And all My Angels on this earth take care of My Errand on every man in this world, hence no one in this world could escape from My Court of Justice and My Judgment. Therefore, seek for protection on My Salvation by shunning away from any sin and by doing fair and virtuous deeds. And fight for the truth with sincere heart and obey all My Fatawas. And consider My Words as the valid statement that I watch meticulously all disputed problems and I adjudicate all mistakes, evilness, oppressions and injustice inside it. And look carefully that all unfair problems will certainly turn back adjudicating and judging. After all, I am enacting My Authority as God The Almighty and The Only One to be the only valid Most Mightiness of God The Only One in human world and in the entire universes. Because I am declaring the absoluteness of the Unification of All Religions in this world to be a universal Absolute Monotheism belief. Therefore, obey it, since it is the only utmost solution for all adherents and all nations. And this is the song Longing for Peace, our dedication for the nations, how the world now is increasingly besieged by various conflicts and enmities, especially when the US President, Donald Trump, implements his anti-immigrant policy. And that leads to numerous intimidations upon the Muslims in the world. Suffering experienced by the Muslims ends not here, in fact Saudi Arabia, United Arab Emirates, Kuwait, Qatar, Bahrain, they are the prosperous Muslim Peninsula countries, yet they take sides with Donald Trump’s policy. the inmates in Tangerang Women Penitentiary. in order to fit as a Video Book. However, nothing changes in the essence. These are my remaining notes as a memory when I was in the prison. presented through the philosophies that I wrote. with the knowledge of flower arrangement. that could make me stay in the prison comfortably. Eden’s Miracle in the Form of Direct Communication of Archangel Jibril the Holy Spirit with the World Public Through I.T. ≈ Comments Off on Eden’s Miracle in the Form of Direct Communication of Archangel Jibril the Holy Spirit with the World Public Through I.T. One more God’s Stipulation that we should release, that is related to the revealment of the Eden’s Miracle and with respect to the miracle of the Holy Spirit, who soon will be performing his act worldwidely through his intervention into the cyber world. The following is our statement regarding that matter and the statement from the Holy Spirit himself related to the text message (SMS) that was sent intentionally by him to Nesya, one of Eden’s guest. And upon that matter, we oblige to release it, for it involves the act of Archangel Jibril the Holy Spirit to be worldwide. Today, we found out about the fact of what was promised by God, that the Holy Spirit will come forth to the world public, which has been proved through the dialogue between the Holy Spirit and Nesya, one of our five guests from the group of young Catholics, who intentionally came to Eden to have conversation for the second time. And she had received an anonymous text message, which she first thought it was sent by Abdul Rachman, who welcomed them during their first visit to Eden on October 4, 2016. Thus, when Nesya asked about the text message to Abdul Rachman and to Her Majesty Lia Eden (called as Paduka Bunda Lia Eden), both had no idea about that text message being sent from Eden to Nesya. But for us, that is the evidence of the Eden’s Miracle that has been opened. That God has promised a great change will happen, for God will prove the Eden’s truth through miraculous things which can process the condition so Heaven in this world will be acknowledged by the world, and the role of the Holy Spirit can be identified by the world public. For us, His Majesty Holy Spirit’s text message unto Nesya is stated as the Holy Spirit’s statement to come forth worldwidely by intervening the cyber technology, especially I.T (Information Technology) now has been proved by him. And this confirmation is actually just a repetition of what has been done in the past, when he first came unto Her Majesty Lia Eden in 1995-2000. During that time he often appeared with miraculous reactions, so Her Majesty and all of us who followed him were assured of this destiny as the destiny that truly came from God. And since 2000 till now, the astonishing occurrences which have brought joyfulness never occur again. It is because henceforward we would have already entered and experienced intensive purification, hence there is no more miraculous demonstration, for we have to go through His Purification by taking a normal life. However, we are already sure about the truth of Eden’s destiny through the whole teaching of the Holy Spirit unto us all, which is given everyday and will continue forever until one by one of us pass away. Thus, we are purified everyday and every time until now. Has Human Being Experienced Heaven? Supposedly Heaven has never become real in human world, would human being still be willing to purify themselves so they can be accepted in Heaven? And if there is a calumny befalls on Eden, whereas Eden Community is not allowed to be involved in any dispute, thus We are the one who will answer all calumnies by making the Eden’s real truth emerges and serves as the testimony for the public. As for Heaven in the world, We should be able to prove its truth, and I ascertain that Eden is the Heaven which I bring down to the world. Thus, I state that a changing nature from human to be an angel in Eden has happened through the happening of Dunuk’s passing. Therefore, We are no longer hindered to declare that Eden is not heretical and misleading. Eden has been absolutized as Heaven that purifies people who are chosen to have the destiny of being accepted in Heaven. In this modern era, it is never expected that there would be such explanation about Heaven, but I establish Heaven in this world for the sake of proving the postulates of My Law upon Heaven. Thereof, Dunuk’s passing I declare as the realization of the postulates of My Law in Heaven. Heaven purification enables man to change nature into an angel. Thus, We have proved it. And I take an oath that The Heaven is Eden. And Eden in Jakarta is The Heaven that bears My Revelations, which I always descend down continually and densely so the world public could see that I always respond to whatever happened in Eden. And it is the performance of the functionalization of Heaven and My Kingdom in the world. And this is My Revelation that has defined Dunuk has changed nature to be an angel. Thus is the appearance of Siti Zaenab Luxfiati (Dunuk) in the sky, witnessed by Ari Peach in Montclair, Virginia, USA, shortly after Dunuk passed away. Hence, the passing of Dunuk is not as perceived of which she is cursed as the consequence of the Eden’s Mubahalla against Marzani Anwar. The testimony of Ari Peach proved that Dunuk is in Heaven after the Heaven’s Oath of Cleansing of the Earth has been released and united with My Oath and the Heaven’s Oath of Cleansing of the Earth by the Holy Spirit and the entire angels on this earth. And be the functionalization of Heaven of Eden’s Miracle utilized to prove the truth of Eden. And emerged Dunuk’s appearance that was truly being witnessed by someone who knew her and whose testimony is honest.